Argentina's Lionel Messi reacts at the end of their goalless 2018 World Cup qualifier match against Peru, in Buenos Aires, on October 5, 2017. 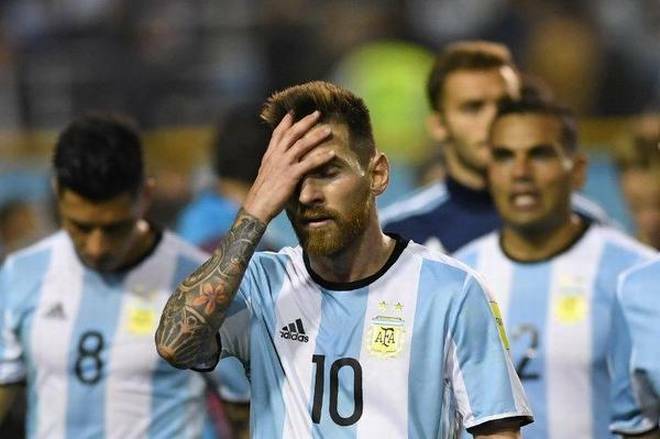 BUENOS AIRES - The prospect of a World Cup without Lionel Messi edged nearer to reality on Thursday as Argentina struggled to a 0-0 draw with Peru which left their qualification hopes hanging in the balance. Despite dominating possession in front of a raucous home support at Buenos Aires' fabled "La Bombonera" stadium, Messi and Argentina once again drew a blank to the dismay of their fans. The result left Argentina in sixth place in South America's marathon qualification campaign for the 2018 World Cup finals in Russia. The first four teams in the standings qualify automatically, with the fifth-placed side going into a playoff against New Zealand in November. Argentina's draw sets up a nail-biting finale next week, with only two points separating third-placed Chile and seventh-placed Paraguay. All could yet clinch an automatic qualification spot depending on results elsewhere. The margin for error for Argentina however has narrowed dramatically after their latest stalemate, their third consecutive draw of a faltering qualification campaign. Argentina's final qualifier is a challenging away trip to Ecuador in the thin air of Quito. Argentina have a poor record in the Ecuadoran capital, losing two out of three of their last World Cup qualifiers there and drawing the other. The Argentines last World Cup qualifying win in Quito came in 2001. Sampaoli had taken the bold decision to leave strikers Mauro Icardi and Paulo Dybala on the bench, opting for a new-look attack led by Boca Juniors forward Dario Benedetto, playing in his home stadium. However the selection gambit largely failed to pay off as Argentina once again struggled to turn their dominance of possession into goals. Messi helped set up one of the best chances of the first half surging forward only to be tackled. The ball rolled free to Angel Di Maria who blazed over the bar. In the second half Messi almost opened the scoring, hitting the post with a deflected effort soon after the restart. Lucas Biglia then went close, forcing a fine save from Pedro Gallese. Gallese then pulled off another save from Papu Gomez, who once again had been played in by Messi. It was Emiliano Rigoni's turn to spurn a chance next, with the second half substitute missing gilt-edged opening provided by Messi once more. The prospect of a World Cup without Lionel Messi edged nearer to reality on Thursday as Argentina struggled to a 0-0 draw with Peru which left their qualification hopes hanging in the balance.